This week we interview the team behind Laneway Learning – a Melbourne and now Sydney-based class provider offering something different from the usual event grind. How did your crew meet and what was the inspiration for starting Laneway Learning? Before Tom moved to Melbourne he was living in New York and had stumbled across a great idea called the Brooklyn Brainery. They had their own space and offered easily accessible classes in a diverse range of subjects. Once he moved to Melbourne he could see that the cafe culture scene here was screaming for something similar and hence wanted to start up something along the same vein; something non-committal, informal and with a massive input from people in the local community. He approached Mark, a friend he had met playing rugby for a local club here in Melbourne, who was blown away by the whole concept and was extremely keen to be involved. Tom had already talked to his girlfriend Kim and Mark soon proposed the idea to his girlfriend, Lucie. So then there were 4 –Tom, Kim, Lucie & Mark – but still it wasn’t a reality because we hadn’t secured a venue in which to run any classes. 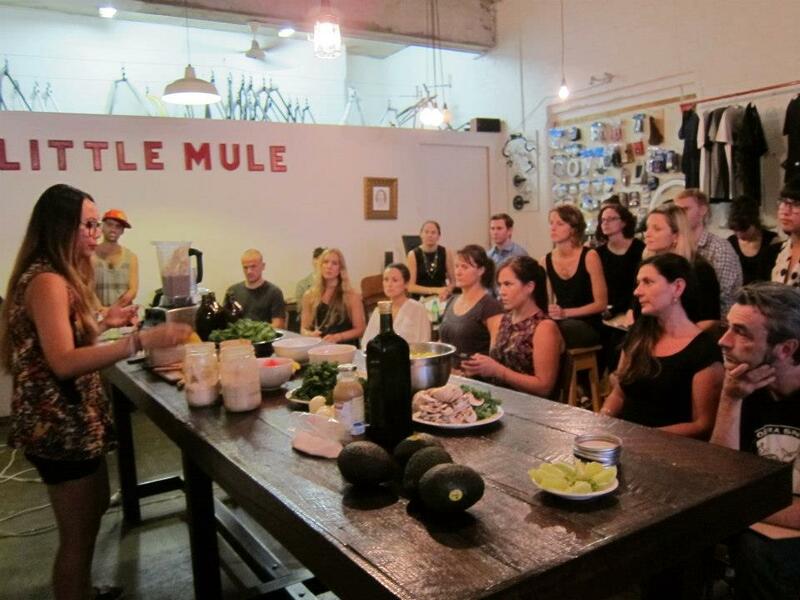 Tom had a chat with a work friend who co-owned a cafe in the city called The Little Mule and thankfully he loved the idea and offered up the cafe as somewhere to run some classes – we ran our first ones back in March 2012. 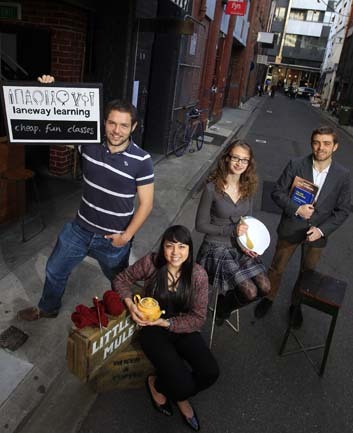 How does Laneway Learning differ from other event series or classes around town? From our own experiences we know that it is easy to get stuck in your work routine and hard to find opportunities to learn. Whilst there are plenty of courses on offer lots of them require you to pay some decent money for a six-week course and in the end you don’t even know if you are going to like it or be able to commit to it each week! What we offer are cheap, informal and one-off classes for people to get a taster of something new. Then, if they enjoy it, they can consider taking on a bigger commitment to their new found educational endeavor. In terms of something a little bit different, there are lots of other options popping up these days. You have Melbourne Free University, The School of Life, A Centre for Everything and Homehouse who all have their own take on ‘alternative education’. Then you have quirky takes on traditional classes; The Grey Eye Society describes itself as a ‘drinking club with a drawing problem’, and Dagmar Rousset on Gertrude St is a fashion shop by day and a French school by night. And then there are the big institutions that are also finding new ways to bring people through the doors, from Melbourne Museum’s SmartBar evenings, to ‘I, Animal’ at the zoo. For us it is about: having a huge variety of interactive classes, taught by passionate knowledgeable members of the community, hosted in what would be quiet or unused spaces in and around town. What has been the most memorable moment to date? During the summer we ran classes on Wednesday evenings down at The Peoples’ Market in Collingwood. One morning we were looking through our spreadsheet of classes and couldn’t quite believe that on that very evening we were going to run our 100th class! It kind of sprung up on us unexpectedly but we decided that it was worth celebrating and picked up a couple of cakes for all our participants in that class. What made it even more special was that people weren’t just happy for us but they were also pleased that they could be a part of our first chapter and for us it really shows that we are developing a community and not just running some classes. Also, the raspberry cheesecake and chocolate gateaux were delicious! Being British and having checked out the scene in NYC – how do you think Melbourne fares globally in regards to creativity and grassroots events? We are lucky that Melburnians are willing to try anything once. The city has a great culture of small bars, independent businesses and a fantastic ‘do it yourself’ attitude. Because of this, Melbourne is up there with much bigger cities and is able to sustain an amazing amount of diversity! These are all great attributes for us to continue what we are doing and also helps other creative and grassroots events be successful in this vibrant city! How can readers get involved in teaching a class? It’s pretty simple really, we think that almost anyone who is passionate enough about their interest can lead a great class. To teach with us it doesn’t matter if you are a university lecturer of 40 years, a small business owner who lives and breathes their subject or a young (or young at heart) enthusiast who is just keen to give it a go. Either way just send us an email (to melbourne@lanewaylearning.com) and one of the team will meet you for a coffee to discuss your plans, work out a lesson plan and will help you develop your class every step of the way. Do you have day jobs? What are the challenges of balancing a growing side project at the same time? We do. Mark and Lucie are both studying for PhDs in chemistry up at the University of Melbourne, whereas Tom and Kim are both 9-5 CBD workers in advertising and travel, respectively. We all commit to LL during evenings and weekends which a lot of people would say is too much but for us it is so much fun. When it is your own project it hardly feels like work at all. Unfortunately for us Tom and Kim are moving to London in the next few weeks and we know that they will not be able to commit to the same level once they are on the other side of the world. So over the last couple of months we have been training up two replacements in Michael and Maria, both of whom have taught a number of classes with us and will take Tom and Kim’s places in the Melbourne team of 4. What are you favourite things to do in Melbourne? Just like a lot of people in Melbourne we love taking a turn down a graffitied laneway and finding something amazing at the end. There is so much to be seen and discovered and we are suckers for hearing a story and then having to go and see it for ourselves. Well, we have been working pretty hard behind the scenes and we are pleased to announce that Laneway Learning is now up and running up in Surrey Hills, Sydney! A friend of ours, Rick, is leading a team of people up there and they are running their first classes at the Cowbell 808 cafe on Bourke street. 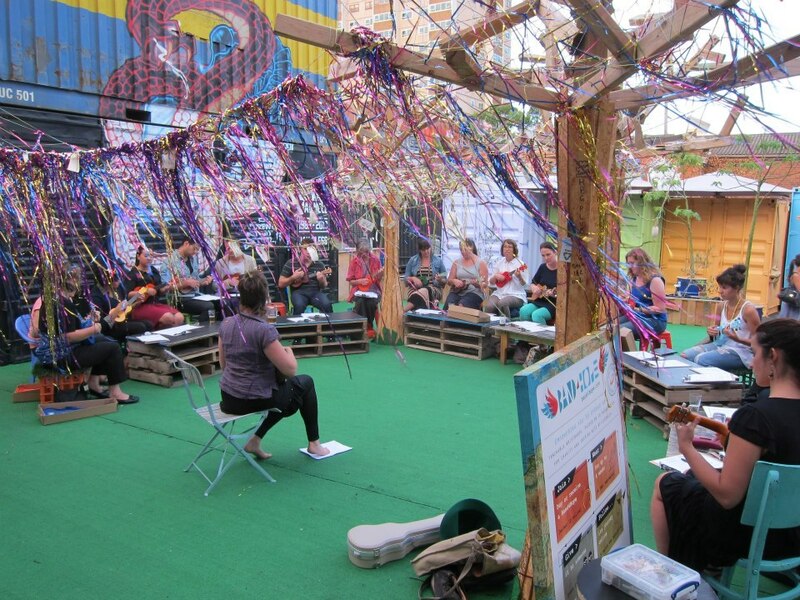 So, if you know people in Sydney that have been looking for some cheap, informal classes in anything and everything then get them to sign up to the newsletter through the Laneway Learning Sydney website. About our Curator // Kate Kendall is the founder and CEO of The Fetch, a community where professionals can discover and share what’s happening in their city. Before this, Kate led product, content and digital at magazine companies, handled outreach for new startups and organised too many communities and events to mention. Follow her on Twitter at @katekendall.